The PT-04 and PT-08 are compact, four and eight channel platinum resistance temperature converters respectively. They offer high resolution, high accuracy readings and are compatible with 2, 3 and 4 wire PT-100 sensors; converters can also be used to measure resistance. The PT-0x has Wi-Fi and USB 2.0 interfaces, which is ideal for remote monitoring applications. Units incorporate a powerful web-server and only require a web browser to function. All units include 256Kb of internal memory for stand-alone operation. You can buy 4/8 channel, PT100 Temperature Converter datalogger from Audon Electronics Ltd.
PT-04: PT-04 Data-Logger with Wi-Fi and USB 2.0. Measures up to 4 PT100 temperature sensors. 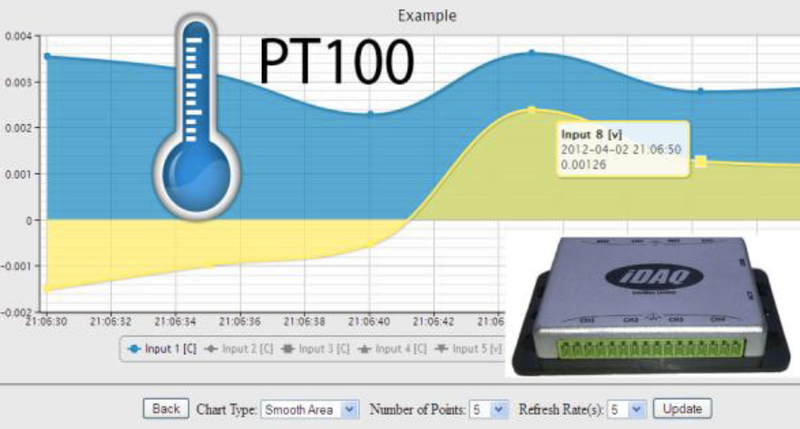 PT-08: PT-08 Data-Logger with Wi-Fi and USB 2.0. Measures up to 8 PT100 temperature sensors.